I’m building a search engine using Anvil. So far I’ve built a Python web app that crawls the web downloading pages. I’ve also implemented PageRank so my app surfaces the most important pages. PageRank weeded out minor pages and made room for more important matches. But it doesn’t take page content into account, so the ranking was still a bit hit-and-miss. I’m currently using Anvil’s full_text_match to perform the search for me. I’m treating it as a black box, which has saved me effort. But it’s time to take matters into my own hands. I’m going to explore more about how the actual search process works. I want to rank pages higher if they have more matching words in them. My pages are currently just stored as big unrefined strings of characters. It’s time to digest each page and get a precise definition of its meaning. I need to tokenize the page - split it into the elemental parts of language. The last step splits the string into a list of separate words. These are one kind of token, but I want more useful tokens, so I’m going to go a bit further. Stemming means each token will be the stem of the word, rather than the word itself. The words ‘build’, ‘building’ and ‘builds’ will all get stored as ‘build’, so they all have the same impact on the search results. Stop words are common words like ‘how’ and ‘to’ that don’t have much bearing on the meaning of a page. I’m going to remove any words from the stop words list used by PostgreSQL’s tsquery. I’m going to do stemming the way you do anything in Python - import a library that does it all for you! In this case I’m using nltk, the Natural Language Toolkit that has a selection of stemming algorithms. This is just what I need to improve my search results - a count of each meaningful word in the page. Now I can order the pages based on how many times they mention each query word. 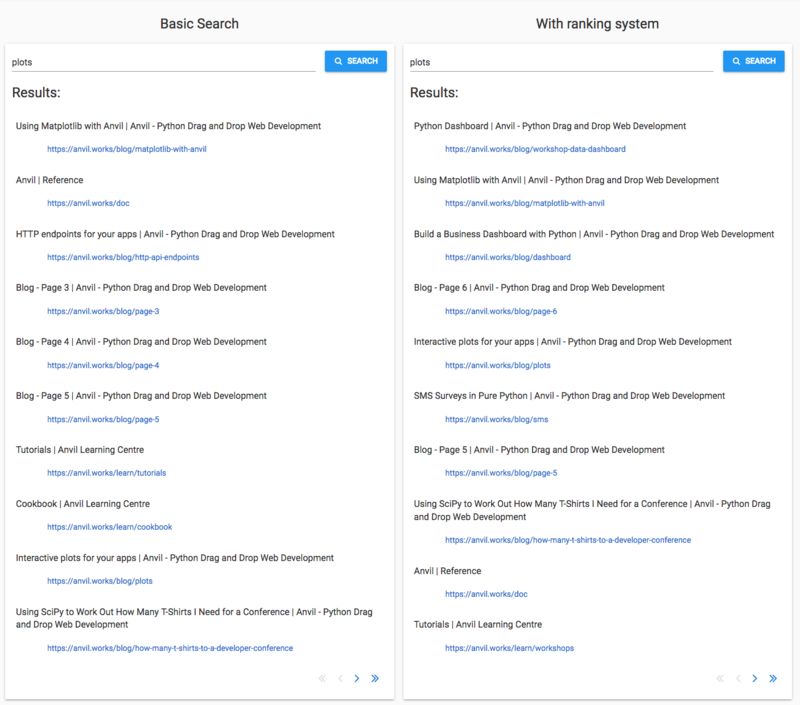 It’s more than that though – it’s also going to let me make my search a lot more scalable. If I ever hope to handle the entire web, I can’t rely on scanning every page for each query. Loading 130 Trillion HTML documents into memory every time somebody searches is a little sub-optimal. Luckily, I already have everything I need to build a search index. Think of an index just like an index in the back of a book. If you’re looking for a particular word in a book, you don’t read the entire book hoping to spot it. You look in the back of the book at the index - you find the word, and it tells you which pages it’s on. That’s exactly what I’m going to do with my web pages. To populate this table, I need to run my tokenize function on all the pages I have stored. """Build an index to find pages by looking up words.""" That second for loop writes the index to the database. It’s much faster to build the index in-memory and persist it all at once than to build it directly into the database. Here’s how I’m building the index. For each token in the page, I check if there’s an entry for it in the index. If there is, I add this page to it. If not, I create a new row in the index for this token. I’ve created a UI to launch the indexing process. 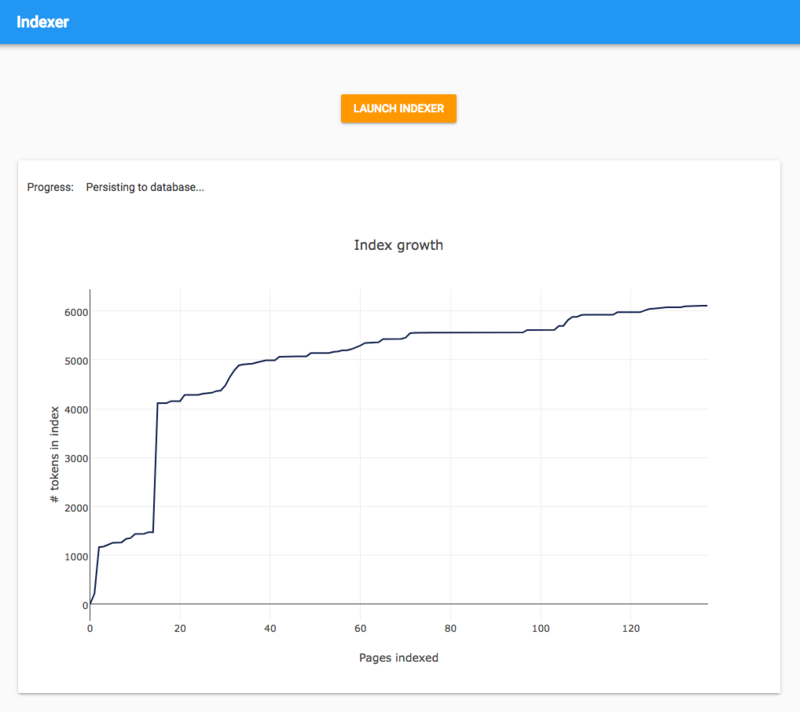 There’s a button to trigger the Background Task, and I’m keeping track of its progress by plotting the size of the index vs. the number of pages indexed. The graph is pretty interesting. You would probably expect it to smoothly approach a particular value, “the number of commonly-used English words”, but actually there are a couple of sudden jumps at the beginning. This must be where it processes large pages with many words, so it discovers a large proportion of the English language at once. Here’s my index in my Data Table. Now I can look up any word stem and instantly get a list of pages it’s on! or 1.3 Exabytes of data. You’d need one million 1 Terabyte hard disks to store that much data, and you couldn’t possibly scan it in time to answer a query. Somewhere in the multiverse, there’s a universe where the laws of mathematics don’t permit indexing. In that universe, the web never took off. I’m just moments away from my production-quality search engine. I just need to concoct an algorithm that combines the token counts I’ve created with the PageRank data from the previous post. This will rank pages based on both relevance and importance. My page_scores dictionary is just what its name suggests: it maps each page to a total score. This is already a set of ranked search results! But they’re only ranked by match strength. I’ll multiply each value by the PageRank as well. You can change the PAGERANK_MULTIPLIER to make PageRank more or less important - smaller numbers squeeze the PageRanks towards 1. What value should I use? You could tune it automatically by changing PAGERANK_MULTIPLIER and comparing the search results against training data. I did a manual version of this - I tweaked it and ran queries until I was happy with the results. I went with 1/3. So now I have a list of pages and a final score for each. I’ll sort in descending order of score, and return only the data I’m interested in - the URL and title of each page, in order. # ... and return the page info we're interested in. And that’s my final search function! It takes in the same arguments as my other search functions - the query as a string - and returns the pages in the same format, so I can use it from the same UI as the other search functions. Time to compare results and see if I really have improved things. In each of these posts, I’ve been running three test queries to make a (pretty unscientific) judgement about the quality of my search results. Let’s see how the final algorithm stacks up. I selected ‘plots’ as a word that would be common in general technical writing. There are a few pages on the Anvil site that are directly related to plotting, so I’m hoping to see them near the top. And I do! In fact, the new search algorithm knocks it out of the park. Two other results use plots in a big way: SMS Surveys in Pure Python and Using SciPy to work out how many T-shirts I need for a conference. A user who wants to learn about plots in Anvil is pretty well served by this algorithm! The new algorithm does brilliantly at this one too. 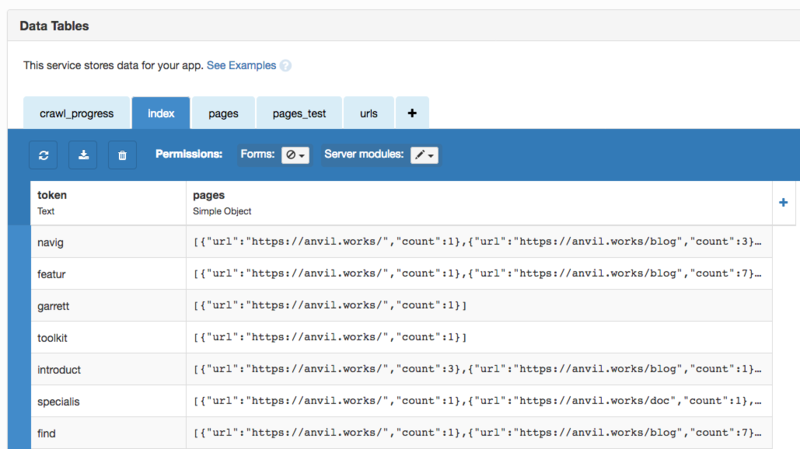 The two most relevant pages appear at the top: Using code outside Anvil, followed by Remote Control Panel. The first of these is the Uplink tutorial, so that’s probably what a user searching for ‘Uplink’ is looking for. The Anvil On-Site Installation page is also in the top five. Among other things, it describes how to connect your app to a Python instance running on your private network, and the answer is ‘Use the Uplink’. That is indeed something somebody interested in the Uplink would like to know. This is the most challenging query to answer because it has multiple words, and only one of them particularly signals what the user is looking for - ‘dashboard’. Item three in the results is Build a Business Dashboard with Python, so that’s a plus point. It doesn’t appear in the Basic Search results at all. The other page I’d expect to see, the Python Dashboard workshop, isn’t there on the first page. Most of the other pages seem to be included because they mention ‘build’ and ‘Python’ a lot, rather than because they talk about building dashboards in Python. A couple of partially-related results from the Basic Search don’t appear in the new search: Interactive plots for your apps and the Remote Control Panel workshop. So mixed results for the multi-word query. Neither a massive improvement, nor any worse. Nearly perfect results for ‘plots’ and ‘Uplink’, but not much improvement for ‘build a dashboard in Python’. Calculating relevance is hard! I was hoping that pages with a few mentions of ‘build’ and ‘Python’ would get dropped because they only had low counts of those words. But, this being Anvil, there are pages that mention ‘build’ and ‘Python’ a lot. I could try matching the entire phrase and/or portions of the phrase (N-grams). I could also start looking at the grammar of the query - ‘dashboard’ is the object noun, so I should weight it higher in the results. Something as simple as giving more weight to words that appear in the page title could also make a big difference. The most promising step, though, is to ask “which words appear more than usual on this page?” instead of “which words appear often on this page?”. I could do that simply by dividing the word frequencies by the average frequency across all pages. 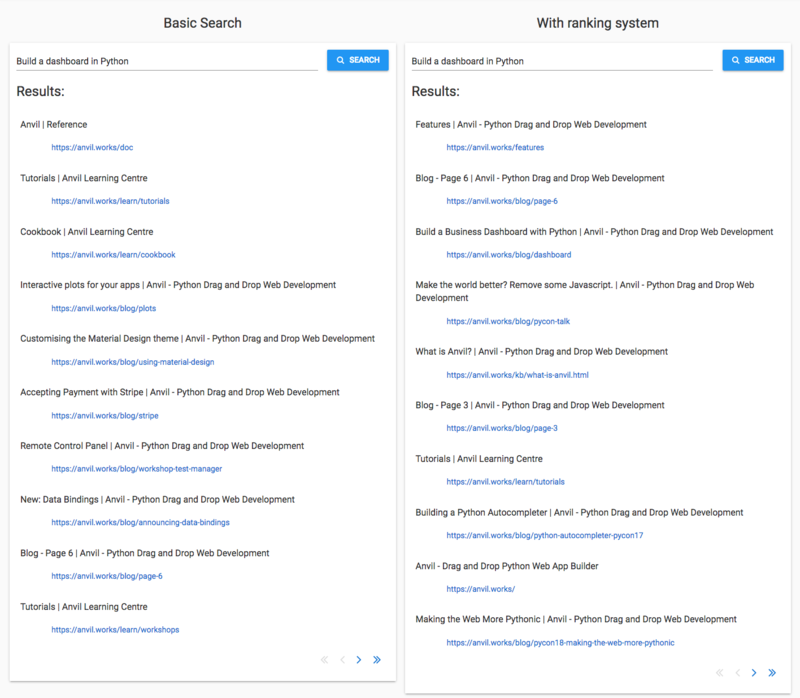 That means words like ‘build’ and ‘python’ that show up on lots of pages would be de-emphasised in the results, but the word ‘dashboard’ will still score highly on dashboard-related pages. The fun thing about playing with search engines is how many things you can come up with to improve the results. I’ve constructed a simple heuristic based on word counts and PageRank, but you can roll things together in so many different ways. You could start analysing media as well as the pure HTML; you could take account of page structure; or you could even track browsing behaviour (anonymised and with permission, of course!). Why not try some things out for yourself? Feel free to clone the final app and tinker with it to see if you can do better than me. Then get in touch via the Forum to show me and the rest of the Anvil community what you’ve done! I’m quite pleased with what I’ve achieved. In a few hundred lines of code, I’ve built a search engine that does a really great job of serving single-word queries from the Anvil site. 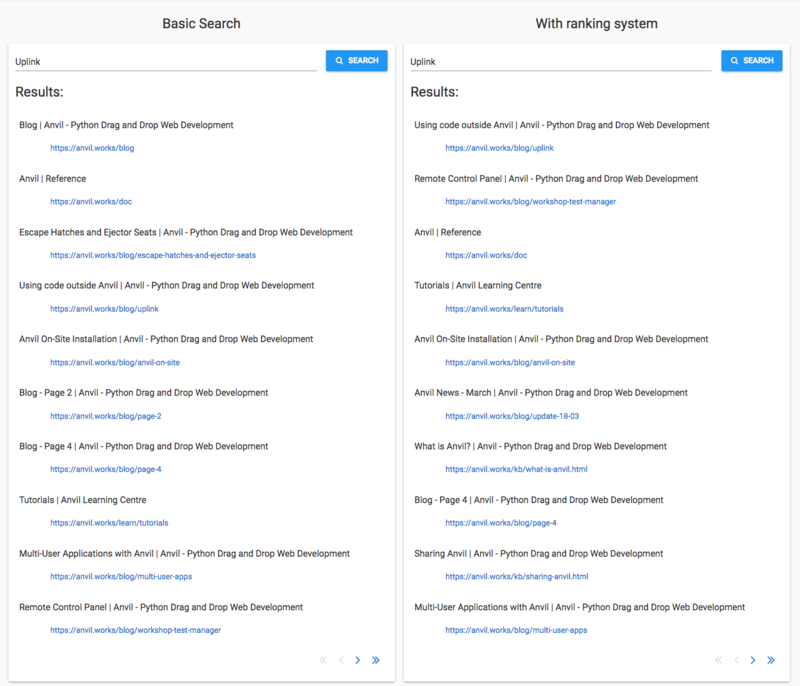 There’s still room for improvement with multi-word queries, but the results are good enough that the user can find the best match somewhere on the first page of results. I’m ready to make it public. And now my search engine is hosted at https://search.anvil.app! That’s the end of my search engine journey. I haven’t quite made a competitor to Google, but I’ve built a working search engine from first principles, and I’ve learnt about some important concepts in the process. Not only that, but I’ve implemented the PageRank algorithm in a few dozen lines of code! I hope you’ve learnt something too. And I hope you’ve seen how easy Anvil has made this. Anvil allowed me to describe exactly how my search engine works, and show you the code. If you’re not already an Anvil user, watch this 7-minute video to learn more. 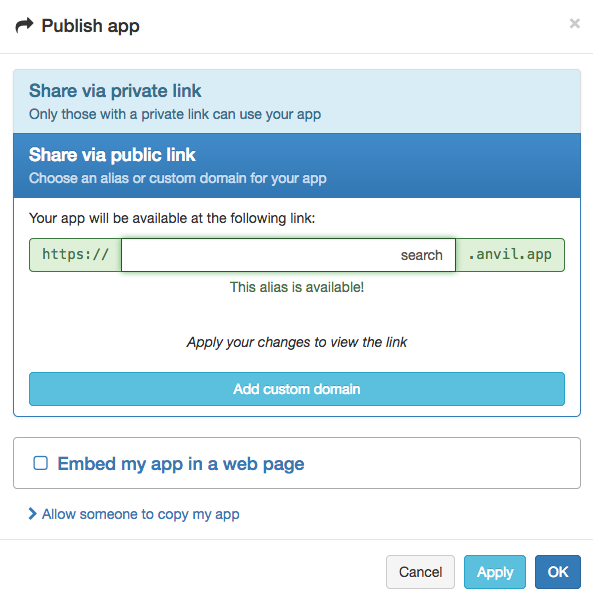 We build a database-backed multi-user web app in real-time and publish it on the internet. Shaun is a Developer Advocate at Anvil.